A team from the School of Earth and Space Exploration at Arizona State University has created a map of the Moon that shows areas rich in titanium ores. The highest titanium abundances in similar kinds of rocks on Earth are around 1% or less. The new map shows that in the mare, titanium abundances range from about one percent to a little more than 10%. In the highlands, the abundance of titanium is less than 1%. The new titanium values match those measured in the ground samples to about 1%. Because specific minerals reflect or absorb certain parts of the electromagnetic spectrum, the wavelengths detected by the camera can help scientists better understand the chemical composition of the lunar surface. Arizona State University’s professor Mark Robinson had previously developed a technique using Hubble Space Telescope images to map the abundance of titanium around a small area centered on the Apollo 17 landing site. By comparing the Apollo data from the ground with the Hubble images, the team found that the titanium levels corresponded to the ratio of ultraviolet to visible light reflected by the lunar soils. To discover whether the technique would work across broader areas, or whether there was something special about the Apollo 17 area, Robinson’s team constructed a mosaic from approximately 4000 LROC WAC images collected over one month. Using the technique they had developed with the Hubble imagery, they used the ratio of the brightness in the ultraviolet to visible light in the WAC images to deduce titanium abundance, backed up by surface samples gathered by Apollo and Luna space missions. 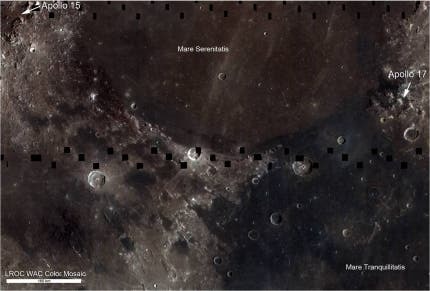 The image above was taken by the Lunar Reconnaissance Orbiter Camera (LROC) Wide Angle Camera (WAC), which is imaging the surface of the Moon at seven different color bands.